Discussion in 'Minecraft Frontiers News and Announcements' started by Tomas, May 29, 2016. Prototype 2 adds a range of new features. Crafting is no exception. The first prototype was heavily focused on crafting, giving us a lot of feedback to work with. This thread offers an in-depth rundown of the changes you will see when you log in. The Minecraft Frontiers economy is built to reward effort and smart thinking. In terms of crafting, this means the more time you spend with the system, the more profit you can potentially make. A player who spends their time blacksmithing should be rewarded with wealth and fame in that area. While this was true in our first iteration, a lot of feedback voiced that crafting is very hard to get into. For that reason, we focused on making crafting more approachable, while allowing seasoned crafters to stand out even more. Our crafting recipes have always used a four dimensional difficulty system. That is, an item may be difficult to craft in four different ways - it may require rare ingredients (rarity); it may require a range of different ingredients (quantity); the ingredients may come from players of many different professions (diversity); or the crafting process itself may require many steps (complexity). While this system offers a lot of variety in difficulty, it is also not intuitive. This is why in Prototype 2, we added three difficulty tiers - "easycraft", "normal", "mastercrafted". Unlike the four dimensions of difficulty (which we are still using to design items), the difficulty tiers are explicitly stated on items. You'll see an item's difficulty tier both in-game and on the Wiki. This allows crafters (especially starting ones) to immediately know how difficult the crafting process is going to be. Each discipline has a few Easycraft items - these are fairly simple and are designed to introduce you to the crafting discipline. Normal items represent a large majority of recipes. These range from fairly easy to craft, to very advanced items. Finally, each discipline has several mastercrafted items. These are the most profitable, but are also very challenging to make. A crafter should avoid these at first, unless they have some time on their hands. Mastercrafted items are the pinnacle on crafting - the ultimate product. Each mastercrafted item has unique lore to go along with it. This makes them very memorable and rewarding to make. They have the best performance and some NPCs may even respond to their users in a different way. A big part of the crafting system is learning recipes. This is what distinguishes a veteran crafter from a novice. Everyone is able to craft anything, but if you don't know which components to use and in what order, you won't get far. However, the most common feedback from Prototype 1 was that learning everything is tedious. This is a fair comment, as we can't expect a completely new player to spend hours trying to craft a simple item. Easycraft Items: Every crafting discipline has around 3 Easycraft items. These are simple to make, but most importantly, the complete recipe (ingredients + crafting order) is made public. You will know exactly how to craft them, and if they require crafted components, you will get the recipe for those as well. The complete recipes will be available on the Wiki, as well as in-game in the form of books. Normal Items: All normal items have their ingredient lists available on the Wiki. This means you will know what ingredients to use, you'll just need to figure out how to put them together. Some disciplines will also have in-game books that give you the ingredient lists without the need of visiting our Wiki. Mastercrafted Items: These exceptionally powerful items will have hidden recipes. This means you will not know what ingredients to use, nor will you know in which order. They often require rare ingredients, so it is unlikely to uncover the recipe without a great deal of effort. To make this easier, certain NPCs will offer pieces of information on how to craft these. We hope the difficulty changes make crafting a lot more accessible to the general public, but still give players enough space to excel at their discipline. All of our crafting recipes have been overhauled for Prototype 2. Don't be surprised if some of your notes from Prototype 1 don't hold up any more. Each discipline should now have clearer progression. Item values are more in line with what you would expect. A loaf of bread is no longer more expensive than an inventory full of gold. When it comes to crafting disciplines, we follow the vision of signature mechanics. 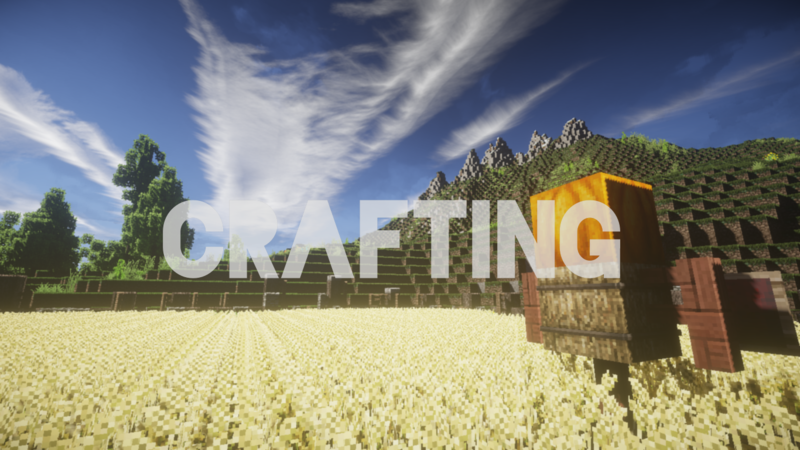 Crafting in Minecraft always follows the same principle - you combine ingredients to form a final item. However, each of our disciplines does it in a unique way. This makes crafting refreshing and offers additional challenge when learning recipes from a new discipline. Blacksmithing: Blacksmithing was the main discipline in Prototype 1. However, it has seen several interesting additions. Weapons now have damage types, meaning weapon smiths can now create weapons optimised against a specific foe. We have also added shields, an important aspect of combat. The signature mechanic are equipment modifications - the ability to take a finished item and improve its stats through further crafting. Jewellery Making: This discipline has new recipes, including valuable mastercrafted items. We are focusing on personalisation with this one, allowing a jewellery maker to add variation to their products. The signature mechanic is engraving, the ability to affect an item's description (and lore) through changing the crafting order. Cooking: Cooking has been completely overhauled. It now uses a variety of ingredients, as well as imported spices from the Mainland. With the addition of animal combat, you are now also able to process meat. The signature mechanic is very important with this one - it is flavours. By combining ingredients with specific flavours (salty, sweet, sour...), your cooked foods will take on these flavour blends. Players will then have their own flavour preferences, affecting how much hunger a certain dish satiates. Tailoring (NEW): Tailors craft a new type of item - armour. These products protect adventurers from specific damage types, greatly helping them on their travels. This discipline has an impressive range of items to craft. Armour pieces come in sets and varying qualities. The signature mechanic is item socketing, the ability to add rare components to the crafting order, influencing the defensive properties of armour. Herbalism (NEW): Food no longer heals wounds. Instead, herbalists are able to brew potions with healing effects. This is key aspect of combat gameplay, as there is no other way of healing your wounds in between fights. Healing potions come in different varieties. The signature mechanic is alchemy, the process of combining reactive ingredients to create surprising effects. Crafting the same item twice may result in very different outcomes. Carpentry (NEW): Carpenters are unique, as their products are not of interest to starting players. Instead, they are a very specialised discipline, crucial to veteran players. The discipline produces house deeds - items needed to construct a building. Whenever a player (or a politician) want to build a house, they will need to obtain a house deed first. This decides what building gets built - and what variation it comes in. More items/disciplines will be coming out throughout Prototype 2. When wanting to sell produce, a crafter has two options. Either use the exports office - this sends the item offshore, paying you from the Mainland treasury in return. The downside is that the demand in the Exports office is limited. Not all items are accepted and if they are, only a limited quantity is desired. The other option is selling to an NPC. Selling to an NPC trades the item for currency. Unlike with exports, your item is stored in the shop, available for purchase by other players. This is the perfect way for crafters to trade their products with non-crafters, in a safe and convenient environment. NPC shops will often buy a range of items, usually based around a similar theme. For example, a tailor's shop will buy all sorts of armour pieces. Unlike the exports office, NPCs also often buy middle components, not only finished items. An exports office only buys finished items. This means an exports office may buy items like an Iron Sword, but won't buy sword blades. NPCs are more flexible, as some of them do trade components, allowing crafters to get rid of excess ingredients (or buy already crafted components). As always, there is a lot more in the works. During Prototype 2, we will be releasing several updates to the crafting systems. The imports office will be opening soon, allowing the Trade Minister to order rare materials from the Mainland. This will unlock a whole range of crafting products, items you won't be able to craft otherwise. We are also working on additional items and crafting disciplines. Expect new weapons, armour colouring, additions to mining, jewellery having an impact on reputation and a lot more. Do leave your feedback and tell us how you feel! We are always reading the forums and take your ideas to heart. QuannTan, MisterErwin, Leviathan and 4 others like this. Saphiria, Tomas and Alir99 like this. Hey! I cannot wait to see you again, you were fun to play with.